Classic MMO gets reheated in December. Long-running MMO Everquest is getting a new expansion, Daybreak games has announced. Titled “The Burning Lands”, the MMO’s 25th (!) expansion is centred around the Planes of Power, originally introduced in 2002 via the game’s fourth expansion. The previous two expansions focussed upon the island of Kunark, home to the Iksar, Everquest’s lizard-men. Hence, the Burning Lands this represents a significant change in direction. The developers were sparing in terms of specific details, but stated the expansion would add the kind of content you’d expect, such as new zones, items raids and so forth. They did state that “air and fire will play a big role in your upcoming adventures,” and implied that the expansion will be geared mainly toward high-level players. The blog also showed off one of the new creatures – which I can only describe as a hot and horny snail. That little fella is below. On a side note, it pleases me greatly that Everquest is still going strong. Aside from the ill-fated Star Wars: Galaxies, it’s the only MMO I’ve ever invested serious time in. I’d be curious to know how many people are still playing it, although Daybreak don’t seem keen to divulge that information. Steamspy states the game had 317 concurrent players yesterday, which isn’t a lot, but obviously you don’t need Steam to play EverQuest, so I’d expect the actual figure to be larger. 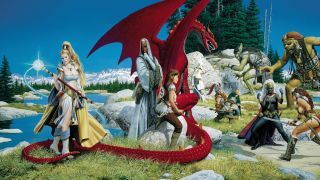 Either way, it’s great to see that Daybreak are still supporting EverQuest almost twenty years after its launch. The vanilla experience is also apparently just as obscure and challenging as it ever was, at least according to PC Gamer’s Luke Winkie when he returned to it earlier this year. The Burning Lands will scorch Everquest’s servers at some point in December. If you want to try Everquest yourself, you can download the game for free on Steam or from the Everquest website.